Reconstruction by Werner Kraus of the palaeodictyopteran Scepasma mediomatricorum. "Flügelspannweite" means "wingspan" - the model is life size. Last week, it was wolves, this week I am once again going to present a previously promised post, pertaining to a presentation on Palaeodictyopteroidea. Palaeodictyopteroids were Palaeozoic pterygotes (okay, I'll stop now) that include what was until recently the very earliest known winged insect, the Early Carboniferous Delitzschala bitterfeldensis (a slightly older wing fragment described by Prokop et al., 2005, has since managed to nudge it from the record-holder's spot). It was, without a doubt, the beginning of a glorious show. All palaeodictyopteroids were large in comparison to modern insects (those with wingspans of one centimetre were among the smallest), while the largest were spectacular by anybody's standards, up to around 55 centimetres for the aptly-named Mazothairos enormis. Patterning preserved on wings in the form of light and dark bands indicates that at least some palaeodictyopteroids were strikingly coloured. The palaeodictyopteroids were also the first plant-feeding insects, with a long piercing beak superficially similar to that of modern hemipterans. Drawing by Woodward (1876) of a fossil of Lithomantis carbonaria. Many palaeodictyopteroids (and a number of other Palaeozoic insects) possessed a pair of broad paranotal lobes on the first segment of the thorax, which has lead to their being described as "six-winged". However, the paranotal lobes differ from true wings in not being articulated. Image via Tree of Life. Ancestral palaeodictyopteroids possessed what are called palaeopterous wings. 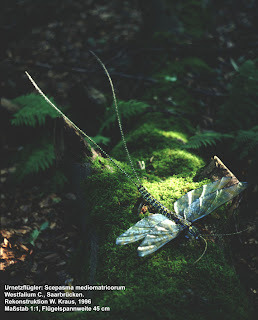 The majority of modern insects (all except dragonflies and mayflies) belong to a clade called Neoptera, characterised by the ability to fold the wings neatly back over the abdomen when not in use. Non-neopteran (i.e. palaeopterous) insects are unable to fold their wings back flat against the body, only move them up and down, so their wings are permanently open*. One group of palaeodictyopteroids, the Diaphanopterodea, did evolve the ability to fold the wings back, but they did so independently of neopterans. Their palaeopterous wings and early appearance have led to a general agreement that palaeodictyopteroids were one of the earliest lineages of winged insect to diverge**. This is also consistent with their development - palaeodictyopteroids had the closest thing to ametabolous development possible for a winged insect, with the wings extended (but curved backwards) in the terrestrial nymphs and growing and straightening incrementally until they reached adulthood (Kukalová-Peck, 1991). As such, palaeodictyopteroids were quite possibly able to fly before they reached full maturity. Among modern insects, mayflies are the only ones to continue growth (undergoing a single moult) after extending their wings. *Damselflies get around this limitation by having a steeply-angled thorax, so that moving the wings "up" effectively moves them back. They still can't close them flat like a neopteran. **A notable exception can be found in the Russian school of palaeoentomologists (Sinitshenkova, 2002). 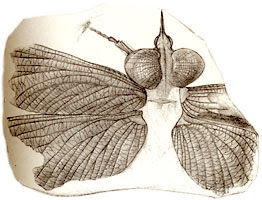 The Russian school, who differ from other entomologists in regarding the neopteran ability to fold the wings as primitive and the palaeopterous orders as derive, regard the palaeodictyopteroids as related to modern hemipterans and psocopterans on the basis of the sucking beak. Fossils of two megasecopterans, Mischoptera nigra above and Sphecoptera brongniarti below, showing the extremely narrowly attached wings on the elongate body. From Carpenter (1951). Palaeodictyopteroids would have certainly been among the most spectacular features of the Carboniferous coal forests. Broad-winged forms such as the Palaeodictyoptera would have been reasonably fast fliers, but perhaps not particularly graceful ones, and probably resembled nothing so much as a miniature World War II bomber plane. Other palaeodictyopteroids, the Megasecoptera, developed elongate wings with very narrow bases. Megasecopterans probably did not fly as quickly as the palaeodictyopterans, but would have been very agile, possibly even able to hover in some forms. One subgroup of the Megasecoptera, the Dicliptera or Permothemistida, were also among those insects to lose the hind pair of wings. While palaeodictyopteroids did not become extinct until the end of the Permian, they were in decline long before then (Shcherbakov, 2008). Correlations have been pointed out between the decline of the palaeodictyopteroids and increasing abundance of dragonflies - the speedy dragonflies seemingly finding the relatively slow palaeodictyopteroids to be a flying smorgasbord. 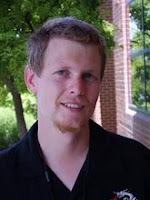 Other factors may have been competition from the also-diversifying Hemiptera, and the replacement of early plants such as progymnosperms with more advanced forms with better protection against herbivores. 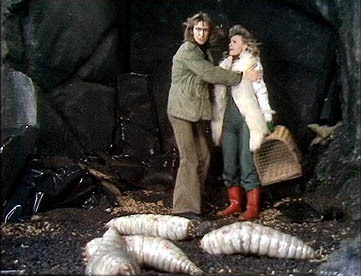 Like the Silurian giant fungus Prototaxites, palaeodictyopteroids had initially diversified when they were pretty much the only game in town, and perhaps they were simply unable to handle the increasing heat. Whatever the reason for their disappearance, they were the most fabulous animals of their time, and the world is all the poorer for their loss. Carpenter, F. M. 1951. Studies on Carboniferous insects from Commentry, France: Part II. The Megasecoptera. Journal of Paleontology 25 (3): 336-355. Kukalová-Peck, J. 1991. Fossil history and the evolution of hexapod structures. In The Insects of Australia, 2nd ed. (CSIRO) pp. 141-179. Melbourne University Press. Prokop, J., A. Nel & I. Hoch. 2005. Discovery of the oldest known Pterygota in the Lower Carboniferous of the Upper Silesian Basin in the Czech Republic (Insecta: Archaeorthoptera). Geobios 38 (3): 383-387. Sinitshenkova, N. D. 2002. Superorder Dictyoneuridea Handlirsch, 1906 (=Palaeodictyopteroidea). In History of Insects (A. P. Rasnitsyn & D. L. J. Quicke, eds) pp. 115-124. Kluwer Academic Publishers: Dordrecht.